Christopher Hitchens has 4 media appearances. Christopher Hitchens discusses For the Sake of Argument: Essays and Minority Reports. Christopher Hitchens discusses God Is Not Great : How Religion Poisons Everything. Christopher Hitchens signs Hitch-22: A Memoir. 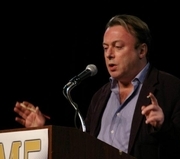 Christopher Hitchens reads from Hitch-22. Christopher Hitchens discusses Hitch 22: A Memoir. Christopher Hitchens's book Is Christianity Good for the World? was available from LibraryThing Early Reviewers. Christopher Hitchens is currently considered a "single author." If one or more works are by a distinct, homonymous authors, go ahead and split the author. Christopher Hitchens is composed of 19 names. You can examine and separate out names.